You've got to have the right tool for the job! Our knowledge of plant and ecosystem function stems largely from observational and experimental science. Most research can be done in a natural field setting under natural conditions, but what do you do when you want to test hypotheses related to projected climate changes or specific environmental conditions. The heart of Biogeography is understanding what limits and what drives plant establishment, function, and community structure across different biomes. This work demands observational, field experiment, and controlled-system research to hold environmental conditions steady so that you can examine climatic features systematically. The benefits of controlled-system research within the context of ecosystem and environmental science was nicely described by one of my mentors, Dr. Barry Osmond, pictured above. Here is a link to that paper in Global Change Biology. Our research group works across the spectrum. ~ "Common garden" experiments where different plants are grown in a similar environment. An example is an experiment we are working on with Drs. Russell Monson & Dave Moore on poplar trees. Monson has a great video about the importance of the experiment here. This is one of the largest controlled-environment facilities in the world, and it is our experimental playground! Biosphere 2 is a collection of biomes, one of which is the Landscape Evolution Observatory. We're using this enormous constructed landscape to study how differences in physical properties of a landscape influence biological patterns of plant establishment and how well they can survive stressful environmental conditions. 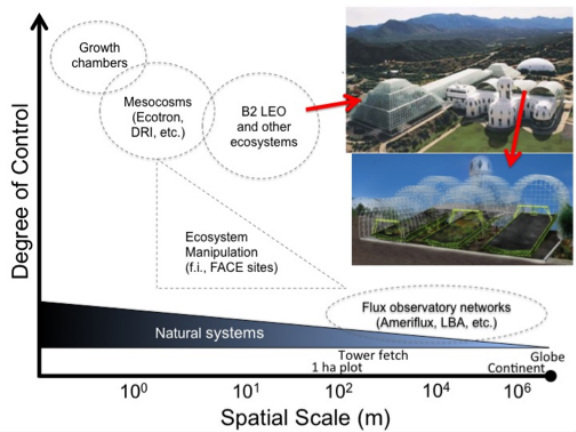 We also use the controlled environment of Biosphere 2 to establish "opportunistic" experiments ~ making use of precise climate control in the view of the public. Biosphere 2 sees about 110,000 visitors per year, representing a fantastic opportunity to talk about science and the importance of science to folks of all ages and backgrounds.